The Internet is now over 40 years old. How did it come about? 'Now You Know' host Todd Grosshans takes a look. October 29 was the 40th anniversary of the very first message sent on the internet. Now there are literally billions of e-mails sent every day, but do you know what exactly the Internet is, and how it works? And did you know that there's much more to the Internet than just what we know as the "World Wide Web?" The Soviet Union may have played a role in the development of the Internet. In 1957, the U.S.S.R. launched into space the first artificial satellite, Sputnik 1. According to Blake Newman, of the Inqbation Web design company, the launch raised concern in the United States that Sputnik 1 was actually a cover for a Russian nuclear ballistic missile system. In response, says Newman, in 1958 U.S. President Dwight Eisenhower established the Pentagon's Advanced Research Projects Agency (ARPA). According to Newman, the new agency was given the task of solving the problem of a breakdown in command and control communications in the event the United States was the victim of a Soviet ballistic nuclear attack. Experts say that the ideas developed by the researchers at ARPA formed the framework and architecture of what we now call the Internet. In 1969, ARPA developed the so-called "ARPAnet," the first fragment of the Internet. It consisted of four nodes, or computer systems - three in California, and one was in Utah. 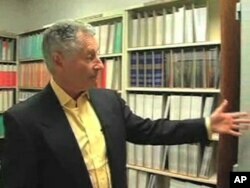 The system at the University of California at Los Angeles (UCLA) was staffed by a team led by Leonard Kleinrock, widely regarded at one of the founders of the Internet. It was Kleinrock who conceived of the way messages would transmit on the Internet, in what is called "packet switching," where a single message is broken up into smaller parts, or packets. As Kleinrock says, a message's packets "... independently make their way through the network, arriving to the other end and being put back together again and being delivered to you as an entity, as a longer message." 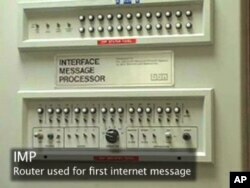 The first internet message was sent from UCLA in 1969. Kleinrock's team of computer scientists sent it to another team of scientists at the Stanford Research Center (SRI). That first message was supposed to be the word "log," as in "log in." Kleinrock recounts his conversation with the Stanford team this way: "Did you get the L? 'Yep, got the L.' [We] type the O. 'We've got the O.' ... [Then] the SRI computer crashed. So the first message ever on the Internet was 'Lo,' as in 'Lo and behold'." The world's first e-mail message was later sent on this ARPAnet system. In 1971, Ray Tomlinson wrote the code that allowed text messages to be sent to users on different computers, rather than to one shared computer. The messaging capacity of computers soon became evident. As the Pew Research Center's Lee Rainie says, "Scientists began to share personal messages with each other. 'How are the wife and kids?' 'When are you going to this conference?' or 'What are you going to do on your summer vacation'?" The fledgling Internet of the 1970s was still an apparatus used only by a select few. This was soon to change with the introduction of the personal computer in 1981, a development that started a massive migration of people to the Internet. The Internet and the World Wide Web are separate entities. The World Wide Web is the so-called 'web-page' part of the Internet. In the early 1990s, computer programmer Tim Berners-Lee devised HTML - it is the computer code used to create the web pages and hyperlinks that you click to get from one page to the next. "It was that which brought on the whole 'surfing the Web,'" says Inqbation's Blake Newman. "Just click, click, click the hyperlinks." Lee Rainie agrees. 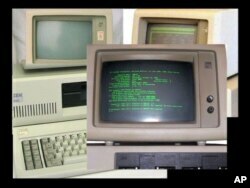 "It was a way for the network of networks to allow many more computers to share information with each other. 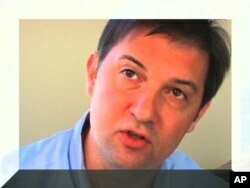 Links have become essentially the currency of the Internet." More than one-and-a-half billion people now use the Internet, almost one-fourth of the world's population.